Another Bosque Fire; Human-Caused, as Usual /Hawks Aloft Inc. The Romero Fire in Corrales, which quickly jumped the Rio Grande and did far greater damage to the Pueblo of Sandia bosque. The apparent cause of the fire was the e-cigarette of a Village of Corrales employee, although there seems to be some controversy regarding that conclusion. I can’t speak to the likelihood of an e-cigarette starting a fire (I don’t even really know what that is), but I have to say that I have seen a lot of very dubious behavior relative to potential fire hazard in the bosque (as well as other open space areas). The most common is people smoking regular cigarettes in the bosque, which…well, let’s just say…I don’t understand. Shooting off fireworks in the bosque/open space is another gem that seems to be more common than people might imagine. Shortly after the Romero Fire (and subsequent bosque closures and partial closures) I ran into a woman walking her dog along the levee road south of Rio Bravo. Once she was satisfied that I had a legitimate reason for being there, she proceeded to tell me about all the ridiculous behavior she had observed in the bosque. 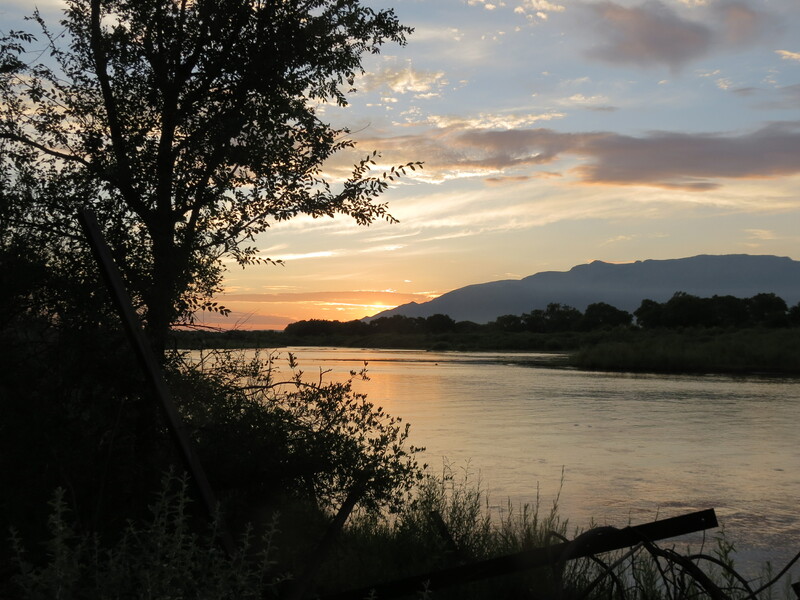 The most recent had been a guy who had built a campfire in the bosque and had it blazing away while he fished the Rio Grande…around mid-day…in mid-June…with temperatures in the 90s. Lest anyone should think this was an isolated incident, I have run into the remnants of campfires in the bosque on multiple occasions. This sort of thing is generally attributed to homeless people, but most of the ones I have seen are in areas that are highly unlikely to be frequented by the homeless, but certainly frequented by partiers. A couple years back the US Army Corps of Engineers stated that all bosque fires in the middle Rio Grande dating back to at least 2005 had been human-caused. Through June of this year, that was still the case. Fire personnel did a remarkable job containing the Romero Fire on the Corrales side, especially given the dense vegetation present in the burn area. 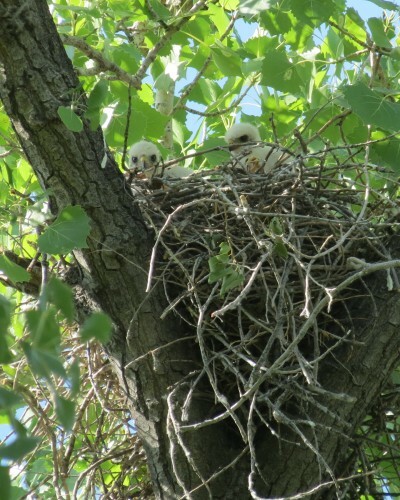 Earlier this year there was an active Common Raven nest and an active Cooper’s Hawk territory (with a historic nest about 80 meters away) in the area the fire occurred. 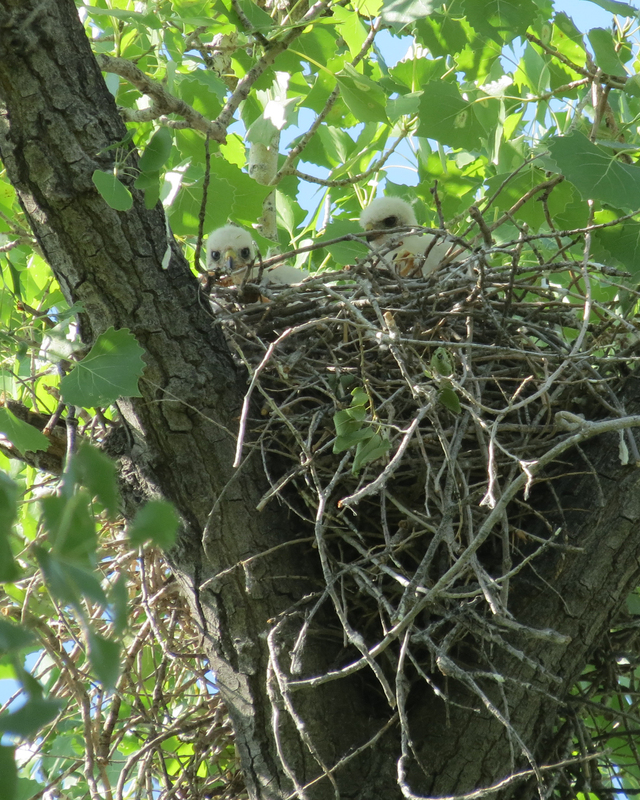 But, in the weeks before the fire I had determined that the raven nest had been abandoned and the Cooper’s Hawks were not nesting in the area. However, there were undoubtedly songbird nests lost in the fire. The situation was much worse on the Pueblo of Sandia side. Apparently, relatively strong winds quickly pushed the fire east onto a couple river bars and ultimately across the river to the Pueblo. We have three songbird transect routes in the burn area on the Pueblo. The two northernmost transects were completely consumed in the fire. A number of cottonwoods adjacent to the river bank were unburned, but further east in the bosque along our transect routes I did not find a single unburned cottonwood. Many of the cottonwoods still held their leaves, but all were burned to a point where they are unlikely to survive. In addition, all understory vegetation and nearly all ground cover vegetation was consumed. It was the largest stretch of uninterrupted burn that I have ever seen in the bosque. 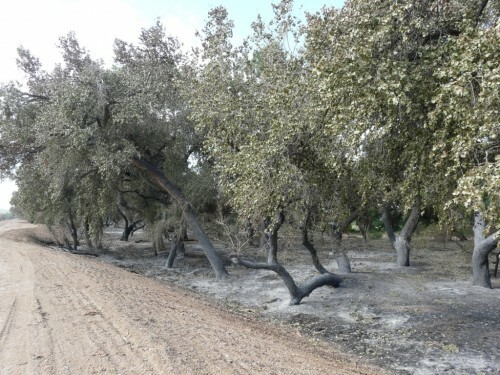 And, all this occurred despite the fact that thinning operations had been conducted throughout the entire area during this past winter and early spring. The situation was similar on our southernmost transect, where the north 630 meters burned. 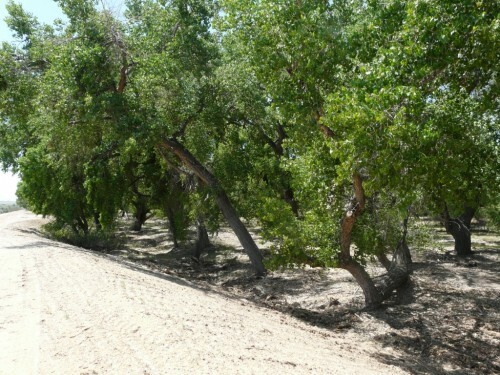 But, I did encounter a few unscathed cottonwoods on that transect. 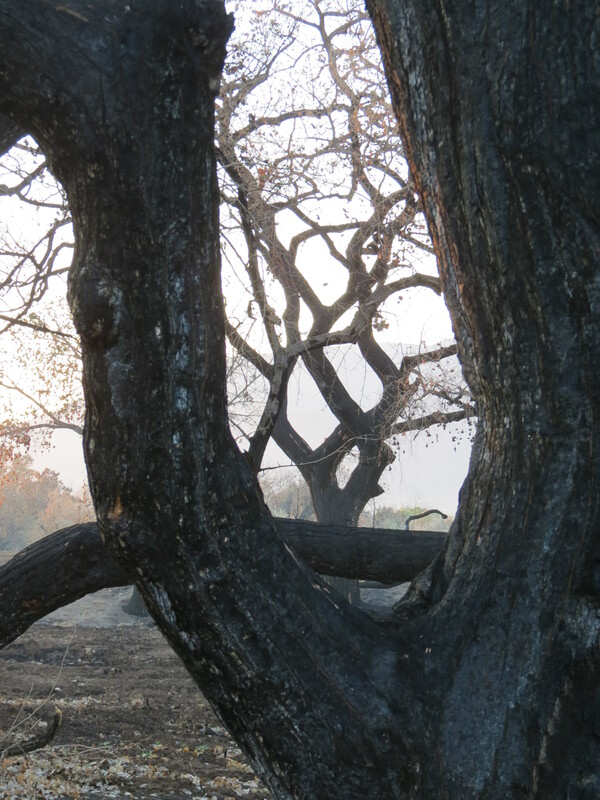 In total, out of 2400 meters along our transects, about 2230 meters were burned. We had only a single, active Cooper’s Hawk nest on the Sandia side, but it was lost in the fire, along with an untold number of songbird nests. However, when I surveyed the Sandia transects on July 2, despite the destruction, many of the bird species had already returned. I am always surprised at how quickly birds adapt and return to burned areas. It will be interesting to see how avian density and richness respond to the fire during the upcoming years. Let’s hope that we have a real monsoon season this year and that there are no further bosque fires.